Inspired by wall art in the commercial and residential design markets, E-Z wall was created for the DIY consumer. There is no hassle when it comes to E-Z wall, simply peel & press. Easy installation requires no cutting saws or heavy machinery. Because of its simple peel and press installation process, E-Z wall brings the organic look of wood planking with a faster, more cost effective designer look. E-Z wall is water resistant, unlike other wood wall décor that will shift or warp overtime due to moisture. E-Z wall remains both stain and fade resistant overtime with its protective surface wear layer so your accent wall will never lose its luster. 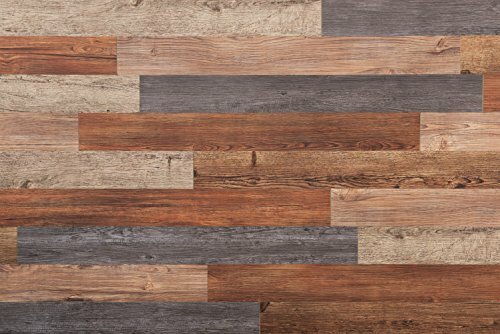 Each assorted wall plank is made from virgin vinyl that contain no fillers or substitutes. If you have any questions about this product by Nance Industries, contact us by completing and submitting the form below. If you are looking for a specif part number, please include it with your message.